As winter turns to spring, melting snow and rainfall conspire to raise the risk of flooding across much of North America and Europe. For telecommunications providers with mission-critical infrastructure in flood-prone regions, humidity sensor technology will be essential for making sure hardware does not become waterlogged and break down. Although this is just one part of a telco's seasonal disaster management program, it is a vital one as flood risk is heightened over the next few years. Although the National Flood Insurance Program noted that any area of North America is potentially at risk of flooding, the odds of rising water levels disrupting operations are especially high for low-lying regions during spring. Melting snowpack combined with seasonal rains can raise river and lake levels to dangerously high levels, and frozen earth during this time of year ensures that water stays above ground instead of being absorbed in the soil. As a result, the National Weather Service Forecast Office recently noted that the flood risk level is high in many parts of the country, including the Pittsburgh area, many parts of the upper Midwest and along significant portions of the Mississippi River basin. Still, while the flood risk is especially high in spring, some of the most devastating floods in recent memory have occurred during the summer and fall. Last year, summer flooding in Alberta caused widespread damage near Calgary, and fall flooding in Colorado shut down operations across the state. This is only scratching the surface of bad floods from recent memory, as Hurricane Sandy in 2012 and the Thai floods of 2011 also rank as among the most damaging natural disasters of the past five years. Unfortunately, the future looks just as bleak, as the risk of flooding is likely to rise to new heights in the coming decades. 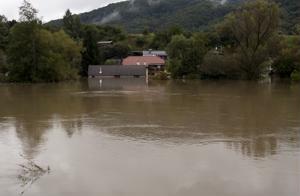 In particular, a study published in the journal Nature earlier this month found that between now and 2050, the amount of damage caused by flooding in Europe will more than double. "Today's infrastructure – power grids, water and sewage pipes, mobile phone masts, roads and railways – is more complex than ever, and we are more reliant on it," The Guardian contributor Fiona Harvey wrote last year. She added, "We know that flooding devastates. We know that, due to climate change, flooding is more likely than ever." How can telecoms prevent flood damage? For telecommunications providers, rising flood risk is a significant threat to operations. Even a little bit of moisture can take critical hardware offline, and even short downtime periods can lead to significant operational losses and angry customers. Luckily, there is a solution to this dilemma: A humidity sensor. With this environmental monitoring technology in place, network oversight professionals can determine early on if rising floods waters are about to disrupt operations and take mission-critical infrastructure offline. Plus, the humidity monitoring equipment from ITWatchDogs includes features such as SMS alerts that can let oversight teams know about a change in conditions even when they are far away from the location in question. While the risk of flooding is great now and will likely not abate anytime soon, a humidity sensor can go a long way for telecoms looking to mitigate this threat.